Lucy DOES NOT want to go to bed. She wants to draw. But as she's working on her masterpiece, Lucy creates . . . Monster! Monster just wants to play. And play. And play some more--until even Lucy is exhausted. 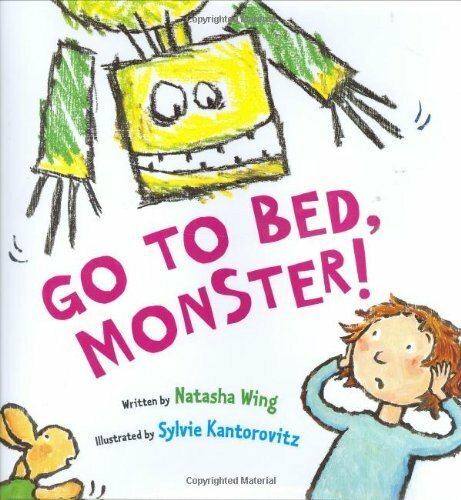 It's going to take some quick thinking (and drawing) to get this tireless monster to bed. . . .
Natasha Wing and Sylvie Kantorovitz have created a sweet and hilarious bedtime tale reminiscent of Harold and the Purple Crayon. It's a story about friendship, imagination, and turning the tables on those little monsters who just won't go to bed! * New copies available through author only. I will sign and ship to you. Email me via the Buy the Book link to the right.